As of January 2017, please refer to the new MEDTEQ website www.medteq.net for latest version. As of July 2017, a new version IBPS 2.0 has been released. The information below is retained for reference and may be out of date. Although some of the tests refer to real pressure sources, in many cases manufacturers of the monitor and sensor are different. 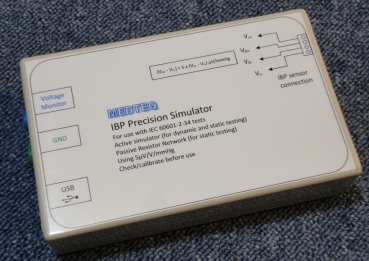 In this case, it can be appropriate to test the patient monitor using simulated signals only, using the industry wide 5µV/V/mmHg specification for IBP sensors. 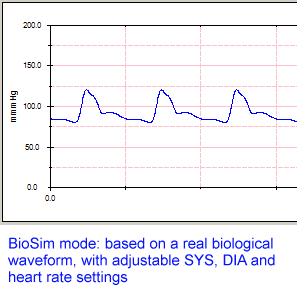 Also for the frequency response test, an alternate method is to test the patient monitor and sensor separately, with the patient monitor tested by simulated signals, and the sensor tested by step response (see here for more details). Refer to the Test Equipment Overview page for links on pricing, operation manual (which includes specifications) and software. Below is a screen show to show functionality. 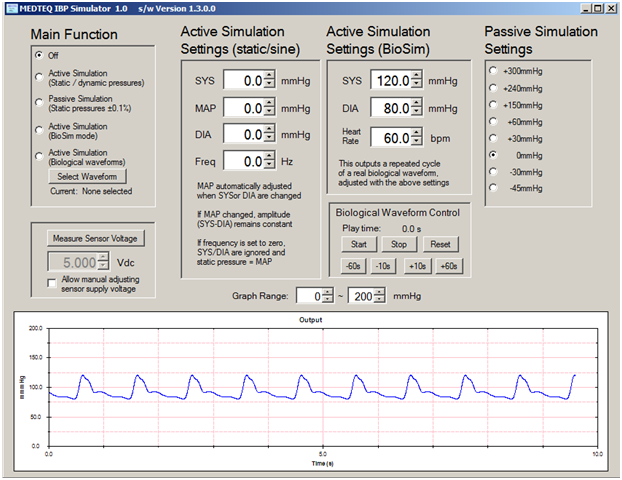 All MEDTEQ software can be downloaded for free and trialed in a simulation mode. DAC compensation applied for increased accuracy. Matches the values in IEC 60601-2-34 for 300mmHg full scale.